You think this is weird? Look up “snake milking”. That’s someone’s job. A design sprint is a five-day intensive process intended to solve tough business problems using design approaches. Design sprints are snake oil, and I’ll tell you why. 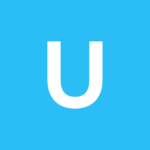 Their creator, Jake Knapp, a designer with Google Ventures, promises fast, tangible results for virtually any problem of any size, in any organization. Back to snake oil. When Chinese workers came to San Francisco as indentured laborers to build the railroads there was no health plan, so they brought medicine from home. One popular remedy was joint liniment made from the Chinese water snake. Like salmon and other cold water fish, Chinese water snakes are high in omega-3 fatty acids. Research has shown that because omega-3's have to stay liquid inside cold creatures at cold temperatures, they have special structural properties that allow enzymes to cross cell membranes. Great for pain and inflammation. American entrepreneurs heard about snake oil and wanted to get in on the ground floor. Given that the Chinese water snake supply chain was a little nonexistent, they had to get creative. Rattlesnakes were plentiful and exciting. And the public wanted simple, exciting solutions to common ailments. So, Stanley’s Snake Oil containing 0% snake of any kind (except for a picture on the label) really had a good run…until about the time the FDA was invented in 1906. 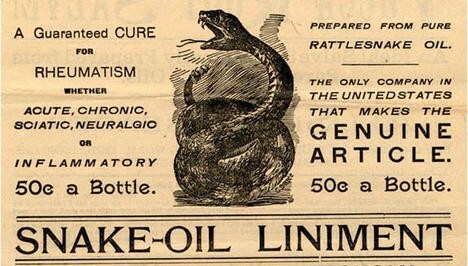 And since then “snake oil” has been synonymous with a scam sold as a panacea, even though it began as a real solution to a specific malady in a particular context. I believe design sprints can help solve hard problems. There is a solid body of evidence, and I respect the expertise of everyone involved in their creation. As with most collaborative methods, I encourage anyone who thinks they might benefit to give it a try. Just make sure you commit to the genuine article. I also believe that design sprints can appeal to people who are looking for an exciting panacea. Or who want to trade their habitual nostrum for another in order to avoid confronting deeper questions. Dogma is comforting, and in this business it goes by many names. Not all design problems are product design problems. Often we use research questions as a way to establish a framework for decision-making or design as a means to reorient complex organizations, one conversation at a time. Some projects require weeks or months because the challenge isn’t generating ideas or artifacts quickly, but turning insights into lasting habits and sustainable processes. So, no matter what your problem is, I suggest starting from a set of goals, rather than a specific solution*, no matter how appealing it sounds. Consider the larger context as well as the issue at hand. And, while I am grateful that the GV team shared their recipe for success, I prefer to remain unclear on how precisely one extracts beneficial fatty acids from a slightly venomous cold water reptile. *Upon reflection, “method” would have been the more apt word here. The moral of this story is that many methods start out as legitimate tools to promote better, clearer thinking faster and end up as activities substituted for thinking (and in the case of the design sprint, shorthand for “you can do anything in a week”). This happens when the method gets watered down and over-hyped in practice. Practitioners start identifying their expertise with the style of activity—e.g. “I run focus groups”—rather than with the substance of the intended outcome and the discipline the method requires.